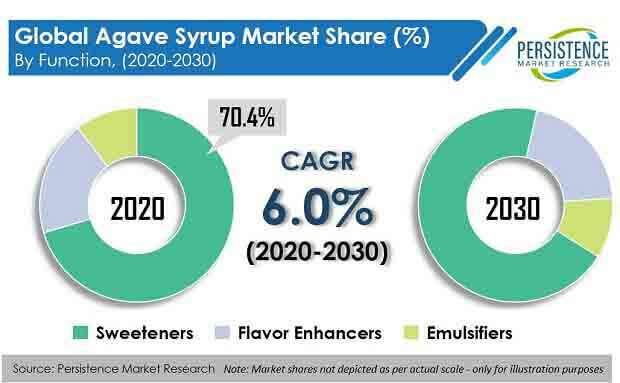 Agave syrup continues to witness lucrative opportunities across various regions on the backdrop of increasing demand for clean label food products. The demand for clean label food has been witnessing substantial growth, globally, in the past few years. Increasing consumer awareness regarding the health benefits of products containing natural ingredients such as agave syrup and strong support from key industry stakeholders for development of such products is the major factor promoting the demand for clean label ingredients, such as those produced without any use of additives, chemicals, and artificial ingredients, and minimally processed. IDEAA Company launched its new line of agave syrup – a range of clean label and organic sweeteners for food manufacturers to fulfill demand for clean label food products. Increasing health problems are linked to poor dietary choices. Rising health problems among children and adults have shifted the preference of consumers to pay more attention towards food products such as sugar and calories. Owing to the change in consumer preference seeking healthier and natural products, the demand for products such as natural sweeteners including agave syrup, is increasing at a higher pace. A recent PMR study pegs the agave syrup market to record an expansion of 6.7% CAGR over the forecast period (2018-2026). Agave syrup continue to witness increased traction in food & beverage industry. They are characterized by significantly lower calories than sugar. Agave syrup is incorporated in beverages, confectionery, baked products, dairy products, and other processed food. The global agave syrup market is growing at a reasonable rate and is expected to continue the same degree of growth during the forecast period. Increasing demand for healthy and low-calorie food products contributes to the growth of the agave syrup market. By type, the agave syrup market is segmented into light and dark. The light agave syrup segment is likely to be the most attractive segment in the forecast period owing to its wide application in food and beverages. This inherited property makes it useful in maintaining blood glucose levels of diabetic patients over the conventional sweeteners. Increasing population demand for natural products has shown downfall in artificial low calorie syrup as compared to the natural syrup. On the basis of application, the agave syrup market can be segmented into bakery, beverages, confectionery, and others. The beverages segment is estimated to account for a significant revenue share of 63.5 % in 2017 and is expected to register significant growth rate during the forecast period. Growing demand for low calorie sweetener in beverages and growing consumer consciousness for calorie intake is driving use of agave syrup in beverage industry. By function, the agave syrup market is segmented into emulsifier, sweetener, and flavor enhancers. The sweetener segment is likely to be the most attractive segment in the forecast period due to the higher use rate of agave syrup in processed food and beverages. On the basis of distribution channel, the agave syrup market is segmented into direct and indirect. Indirect segment is further sub-segmented into store-based retailing and e-Retailers. Amongst these sub-segments, the store-based retailing is anticipated to occupy a significant market share of 90.8% in 2017. The e-Retails sub-segment is expected to register high growth rate during the forecast period. Asia-Pacific and Europe are the prominent market for agave syrup globally gaining market share of more than 50%. Asia-Pacific market is anticipated to grow at significant rate of 6.4% over the forecast period. Increasing focus on R&D in the existing product line to manufacture superior products such as organic agave syrup, which is natural or plant derived, is expected to showcase lucrative growth. Increasing adoption of ready to drink beverages in developed countries, especially, in APAC and European region have boosted the market growth in these regions.